MANY of my photos and videos are blacked out in my gallery or partially blacked-out. I can not see the photos and when I try to play the videos I get a message that says, "Unknown error has occurred." I fear I have lost many precious videos and pictures. Does anyone have any idea why this is happening and/or how to fix it? Thanks to all! Are they on an SD card that was encrypted on another device? If they're on an SD card that wasn't encrypted, see PhotoRec (instructions at PhotoRec Step By Step). If they're on the card, even if the filesystem of the card is damaged, PhotoRec will recover them. But if the picture and video files themselves are corrupted ... that's why we make backups of anything important. All computers eventually corrupt files. A backup on an SD card that's put away from safety, and a backup to at least each of 2 cloud accounts, makes it pretty certain that, when you first have a problem, at least one backup will be good. 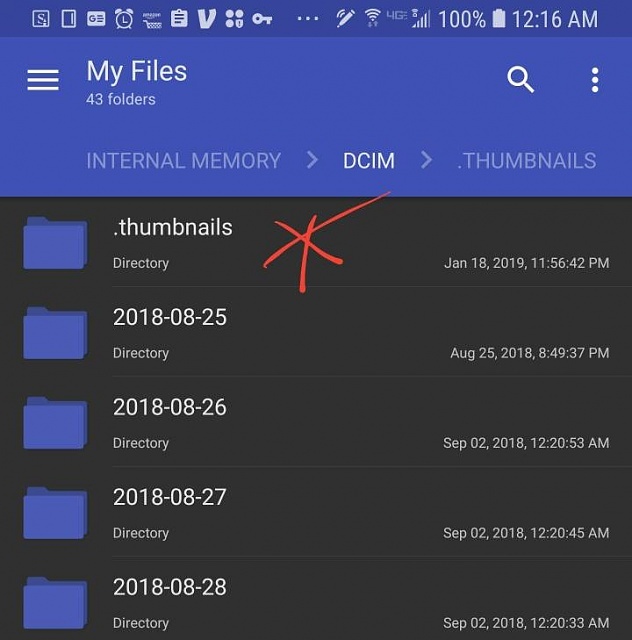 The SD card was new when I placed it in the phone and I did format it after installing it, however I realize that doesn't mean it isn't now corrupted. I didn't think about that possibility and will replace the card. The odd thing about this issue is I can see the pictures and videos as thumbnail images but they grey-out when I click on them. Any other help is appreciated! Thank you! What happens if you Unmount the card (in Settings>Storage), remove it, and insert it into your computer's SD reader? Can you see the photos on the computer? If so, backup all of those photos to the hard drive now. ... The odd thing about this issue is I can see the pictures and videos as thumbnail images but they grey-out when I click on them. Any other help is appreciated! Thank you! That happened to me, don't remember which Note, but somehow, in the middle of my panic, I managed to think to save the thumbnail files. They are very small size wise, but when they are precious photos, small is better than gone. Not odd. The system creates the thumbnails after the media is registered for display on the Gallery (better than handling a much much larger photo file and to show multiple of those on screen at the same time). The thumbnails, however, are not stored with the picture itself, so those didn't get wiped out with the corrupted/damaged card, but the original file they reference to, did.